The sculpt masking code is now finished-ish. I’ve just completed my own review of the code, checking each commit and fixing various bugs. I’ll be submitting it for code review soon (no rush since it won’t be going into trunk until the start of the 2.64 release cycle), but before I do there’s time for more user testing. No doubt there are still bugs there just waiting for you to find them! Check also the masking documentation on the wiki in case there is anything missing there. The code is as always available from the masking branch of my github repository. Post builds on GraphicAll if you got ’em. Add mask-drawing support to GPU_Buffers. pipeline requires colors to be either three or four components. will work correctly with masks. Use VertexBufferFormat for multires VBO. Add keymap and menu entries for masking. * Add CTRL+IKEY to invert the mask. * Add ALT+MKEY to clear the mask. Add support for hiding masked regions. Add a new mode, PARTIALVIS_MASKED, to the PAINT_OT_hide_show operator. Add a paint mask operator to clear, fill, or invert the mask. Update the keymap for the mask brush. * When the mask brush is active, SHIFT toggles it into smooth mode. Add mask brush for sculpt mode. The mask brush currently has two modes, 'draw' and 'smooth'. Add new mask-brush icon from Julio Iglesias. Use paint mask when calculating sculpt strength. Add undo/redo support for paint masks. 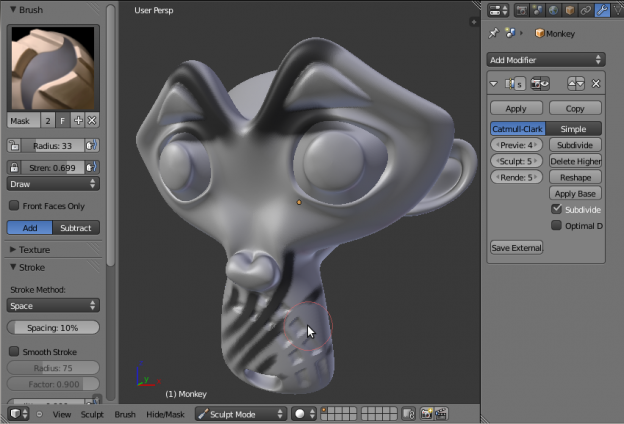 Ensure mask layers are always present in sculpt mode. Copy GridPaintMask to vertex paint mask when applying multires. Add mask support to CCGSubSurf and multires. there only to give CCGKey information on the mask. displacements are), so we skip subdividing paint masks here. properly even when not in sculpt mode. Add GridPaintMask accessor to paint.c. Add paint mask access to the PBVH vertex iterator. Add access to mesh vertex customdata to the PBVH. Add DNA and customdata entries for paint masks. but contains an array of scalar floats. Replace hardcoded DMGridData structure with CCGElem/CCGKey. Add CCGKey/CCGElem for accessing CCGSubSurf elements. Modify CCGSubsurf to subdivide an arbitrary number of (float) layers. can now be any number of floats. the number of layers to less than N, but not more. * The rest of the changes are just adding the 'ss' parameter. Add new options to PAINT_OT_brush_select, toggle and create_missing. option is enabled, a new brush of that type will be created and set. Add an RNA access function to get an enum item name from its value. order to be more similar to subsurf_make_derived_from_derived(). Code cleanup for parameters of subsurf_make_derived_from_derived. awesomeness. You are the man! Sculpt masking has been in trunk for a bit, so pretty much any recent build (e.g. from the buildbots or from graphicall) should have it. Really because I’m using 2.63a and it isn’t a masking option, I’ll check buildbots or graphicall. Thanks so much. Cool, I downloaded ver 2.63.11 it’s ssssssooooooo nice to have masking and I love the skin modifier I got to push them both a little further “BUT BIG UPS” to Nick awesome stuff as usual. Hey do think you’ll be able (I mean have time for I know your able) to make a scale brush so when I mask off areas I scale on all axis? You can check out my website and what I’m working on, my latest post is a super hero sculpt and that’s why I’m so interested in masking.